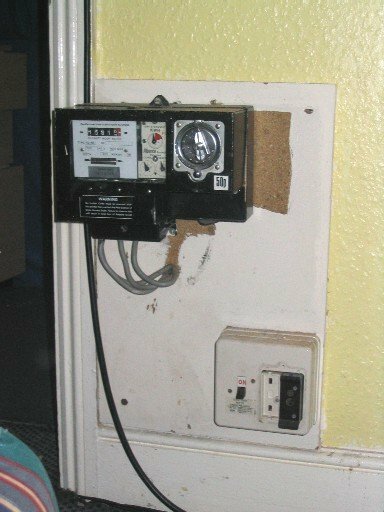 Register Log In ECN Forum Forums Violation Photo Forum What's wrong with this (UK) fuse box? Anyone fancy picking this photo to pieces? I sure do every time our 'electricians' call. FYI: Its the main fuse box for my student house, Norwich, UK. What do you think? More info and pics to come! This really is foreign, Ash. Are those unprotected wires feeding this panel??? What size main does it have? This is an older-style Wylex panel, a very popular make which has been used here for many years. 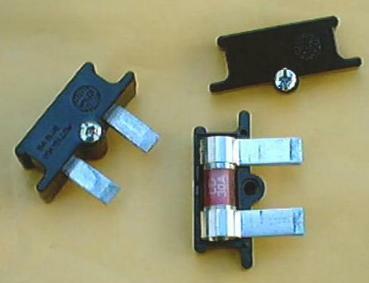 These "Standard Range" panels will accept three different types of protective devices, all of which can be seen here: Rewireable carriers (most of them), cartridge fuses (left hand half, rightmost position), or circuit breakers (you can find them yourself! ). Go here and look at the "Wylex Standard Range" links for more. The MCB circuits seem to have multiple wires on them, so perhaps these are feeding rings in shared areas such as a kitchen and communal lounge. I would guess that the lone 5A fuse is lighting in shared hallways etc. Why the spare 5A carrier laying on top? Has something been changed recently? The phone number on that blue sticker is very familiar to me, and it's a little blurry on my monitor, but it looks like it says "EDF Energy" on it, so that sticker can't be very old. The obvious question: Who lost the two screw-on covers? pauluk, can you explain a bedsitter unit for us yanks? Each room is on a 30A Radial, with its own two carier fuse box, a 5A for the light and a 15A for the room power radial. The coin meters have been "bypassed" by doubling up the phase on input lug, so basically they are just there for show. With all of us having at least one computer, we'd be pretty miffed at having to put another 50p in the meter every few hours! Al - A "bed sit" is a single accommodation unit, much like a "dorm". Depending on the setup it may have cooking and washing facilities, ours are just simple bed rooms. What you cannot read, just below the main switch, is "Total Load Not to Exceed 100A", Hmmmm. I've never pulled the cariers to see just what they do feed, but i do know there are six rooms on 30A radials. There are two showers installed, so most likely a 30A each. The first (32A) breaker (from left) is the communal ring main and some of the kitchen. The second (32A) breaker has three 2.5mm T&E (Our equivilent to Romex??) attached and isolates the boiler and ? 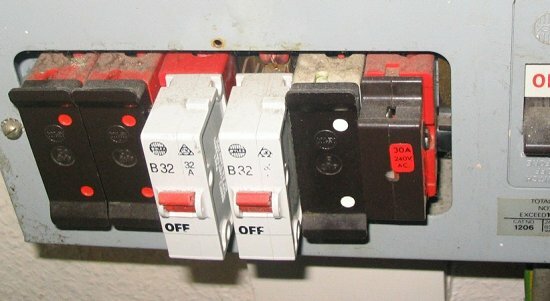 ?, but as individual circuits each wire would not be rated for that 30A breaker (a story in its self - notice the discolouration of the panel above it). The 5A (White) carrier is for the communal lights. The spare 5A carier on top was originally in place of the first 30A breaker (???) Which i questioned when we moved in. The electrician just pulled it and left it at that. They got a call a day later from us complaining that our freezer had defrosted and ruined my ice cream! can you explain a bedsitter unit for us yanks? Just to add to Ash's description, the name is derived from bedroom/sitting room, the latter being a variant British term for lounge or living room. Bedsits are commonly found in old parts of town where a big sprawling Victorian house has been divided up into individual accommodations. They often have shared kitchens and bathrooms. You mentioned a feed to a boiler, so do you have oil/gas-fired central heating in the place rather than individual electric room heaters? That would help keep the loads down in each room, although I assume that you have the ubiquitous kettle in each room, and maybe even some microwave ovens or hotplates. Whether the total expected load after applying diversity exceeds the supply rating could well be down to such issues, although two 7kW+ showers might be the main cause for concern, especially as I would say they are quite likely to be running together and at the same time as cooking loads. The second (32A) breaker has three 2.5mm T&E (Our equivilent to Romex??) attached and isolates the boiler and ? 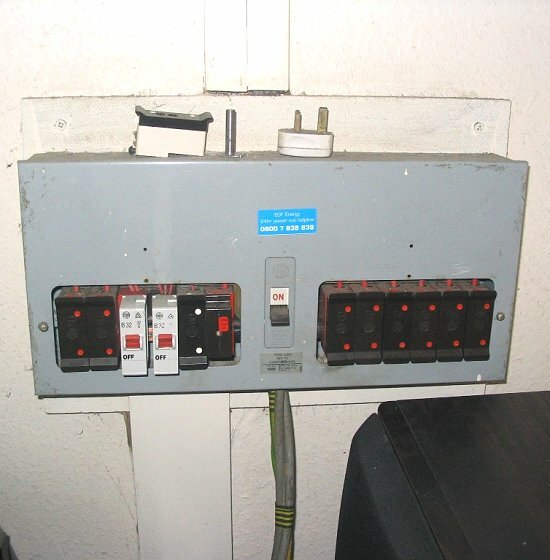 ?, but as individual circuits each wire would not be rated for that 30A breaker (a story in its self - notice the discolouration of the panel above it). Yes, Romex is the nearest American equivalent of our T&E, or 6242Y. I missed that discoloration first time, but looking more closely it's definitely visible as a track above that MCB. I find that in a lot of these old places a circuit which clearly started out as a ring has been broken at some point during modifications, then extra loads have been piled onto the two separate halves until overloading takes place. we'd be pretty miffed at having to put another 50p in the meter every few hours! And if the meters actually take 50p. coins, maybe the owner didn't want to go to the expense of changing the mechanisms when the smaller coins were introduced a few years ago? Put your hand on the cables. If they are hot --> problem. If they are not --> no problem. The setup is basically a large turn of the (20th) century house with communal kitchen and bathroom, so much like any house really, just coin metered bedrooms, which are now bypassed (They do take the old large 50p coin), so its all a bit of a muddle. We are metered and billed directly by the PoCo, and as a house of 5 guys manage an average of £100 a month!!! Diversity seems to have gone out of the window here really. Each room is on a 30A rewirable (yuck!) fuse, but the total loading in each room is only that of a 5A light and 15A radial. Its the other circuits that are a bit concerning. installed in each of the rooms. The coin pan has been removed from the meter (it would have originally sat under the coin slot and fastened with a padlock). The small two carrier fuse box has a 15A (Blue) and a 5A (white)(removed) carrier.